This mountain ridge is called അനങ്ങന്‍ മല (Anangan Mala). I cycled out to the base of this ridge, and then hiked up to the western tip. Grasses as tall as a person grew in a broad meadow over the curved top. The sun had burnt the grasses a deep orange brown. The stillness was as much a part of the experience as the mountain itself. The ridge ascends eastward in a long curve, and I returned on another day to explore it further. Tall grasses grow on the high, rounded crest of അനങ്ങന്‍ മല (Anangan Mala). On patches of exposed bedrock, I saw small, scattered piles of these seeds. I presumed that the piles of seeds were left over when people harvested them. 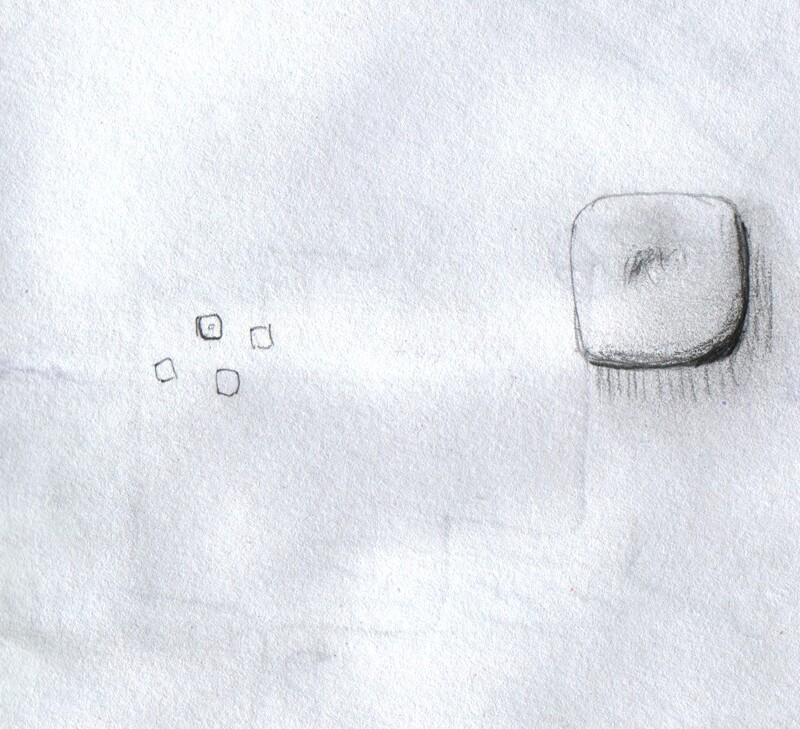 The seeds are square and flattened, like a throw pillow, and they have a dimple in the middle. The seeds measure about two millimetres on the side. 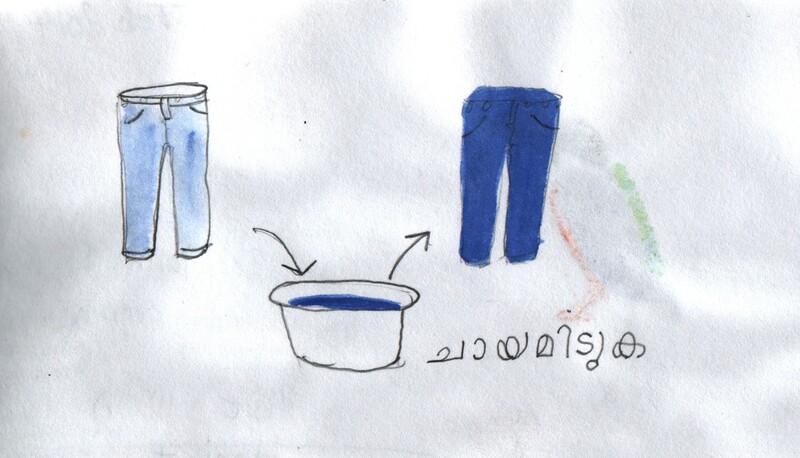 I drew this sketch in order to explain that I wanted to buy blue dye. I had a dictionary with me, where I found the word ചായമിടുക (chaayamituka) which has several meanings. A sketch helped me narrow it down to the meaning that I had in mind. My blue trousers had begun to fade, and I wanted to dye them to revive their appearance. It turned out that the local shops had dye, but were sold out of blue. This view from the hotel roof shows the mountain ridge അനങ്ങന്‍ മല (Anangan Mala) in the distance. This vista is more urban than it appears. Trees grow high and conceal the buildings below, giving the impression of a forest canopy that stretches into the distance. At a certain distance, the town does give way to forest and rice paddies. 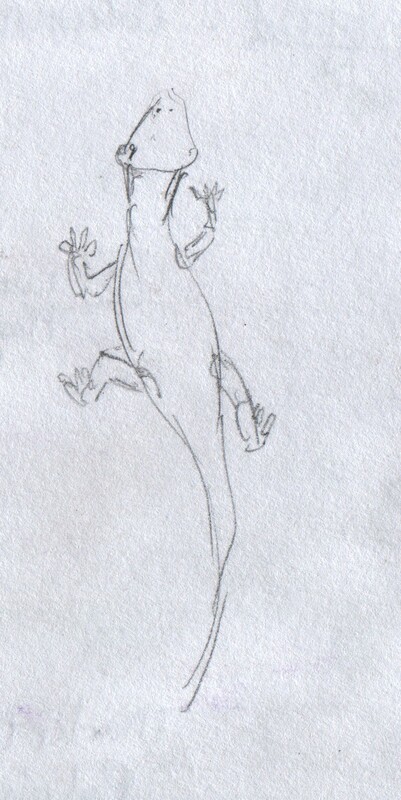 These little house lizards, a type of gecko, were a delightful part of daily life. The moved silently about, swiftly running up vertical surfaces and stopping in the middle of a wall. I was always happy to see them. They showed up unexpectedly, so I never knew when I would see one next. I never heard them chirp, though they are reputed to do so. These lizards are known in Kerala as പല്ലി (palli). A check dam on the ഭാരതപ്പുഴ (Bharatapuzha), or Nila River, is a gathering place for people to gather, socialize, swim and do laundry. 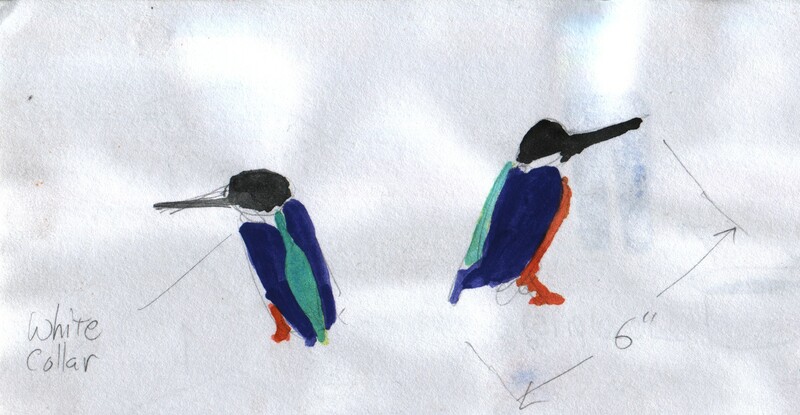 I saw this bird with vivid blue colours. I sat down to sketch the bird. A boy ran home and returned, showing me his sketchbook where he had drawn the same bird. The local people identified this bird as a kingfisher. One day I saw this larval case moving about. It is possibly a bagworm. This insect builds for itself a case out of sand, twigs, and whatever loose items it can find. It uses its own silk to glue it together. The larva becomes a moth as an adult. I watched it for a while, and collected it in a container. When disturbed, the larva can turn around inside its case and its head can emerge from the other end. I released it outdoors. In Canada I had only seen an aquatic adaptation of this sort, which we know as a caddisfly larva. They live in ponds and make their portable houses out of twigs and evergreen needles. I wrote a list of Malayalam letters in the back of my sketch book in order to help me look up words in the dictionary. 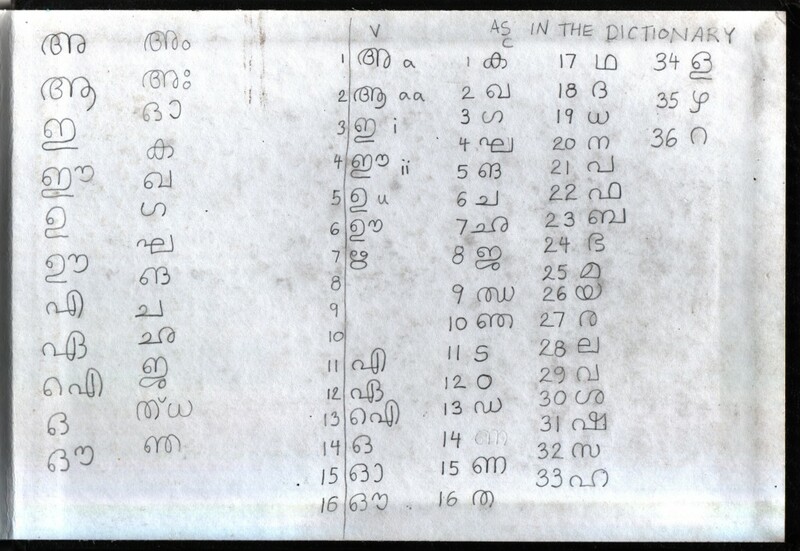 Malayalam has dropped several letters from use, and those letters once occupied the blank spaces in the list. The remaining letters have kept the same numerical places in the list. The Malayalam word for the Malayalam script is മലയാളലിപി (Malayaallalipi). This riverbed was nearly dry. River flow is seasonal in this area. This rock is called Elephant Rock. A tree stands at the base of a sloping expanse of bedrock. Right next to the tree stands a room-sized boulder, as though it had rolled to the tree and stopped there. 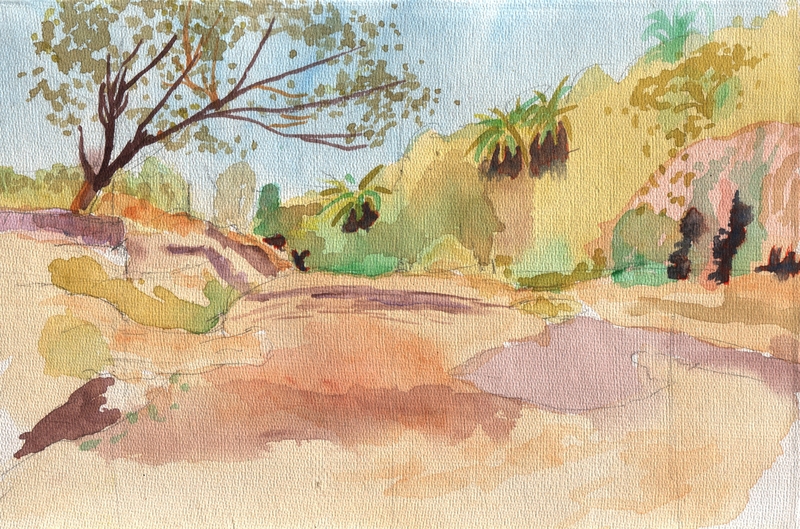 On one of my daily cycle rides through the countryside, I noticed this rock and resolved to return another day to sketch it. 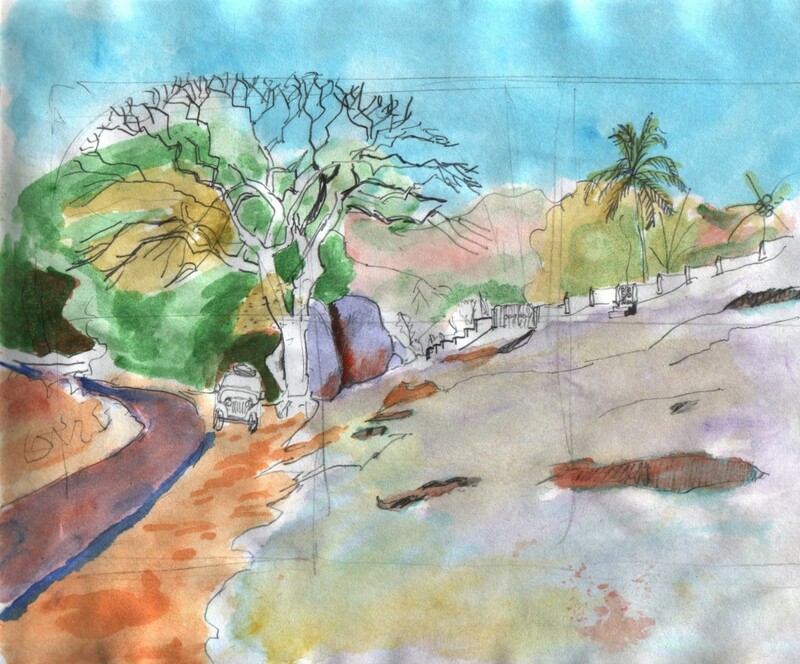 When I did return and paint this watercolour, people told me that the rock has a name, ആന പാറ (Aana Paara), Elephant Rock. I thought that this combine harvester was a clever design. The builders took the classic, separately powered threshing machine design, which has existed for about 80 years, and installed a modern tractor, in this case a John Deere, on top of it to provide motive power. In place of the tractor’s rear wheels, sprockets drive chains connected to the harvester’s front wheels. The tractor controls, such as the steering wheel, are connected to the combine harvester. The combine head is removable so that the machine can tow it on a trailer. I looked over the machine. Many of the parts are shop-made or generic bearings, sprocket and chain. Any town with a welder and a fabricator can make significant repairs to the machine. The owner does not appear to be completely dependent on a brand-specific parts supply network for spares. All the high technology is concentrated in the tractor up top, and the tractor already has a dealership network. So the combine manufacturer may not have to set up as much additional logistics to support the customer base. I saw numerous such combine harvesters travelling the highways. They roam the countryside, harvesting fields as needed. I sketched this machine with its driver resting in the midday shade. I believe that “Standard Combine” built this machine. Wow! 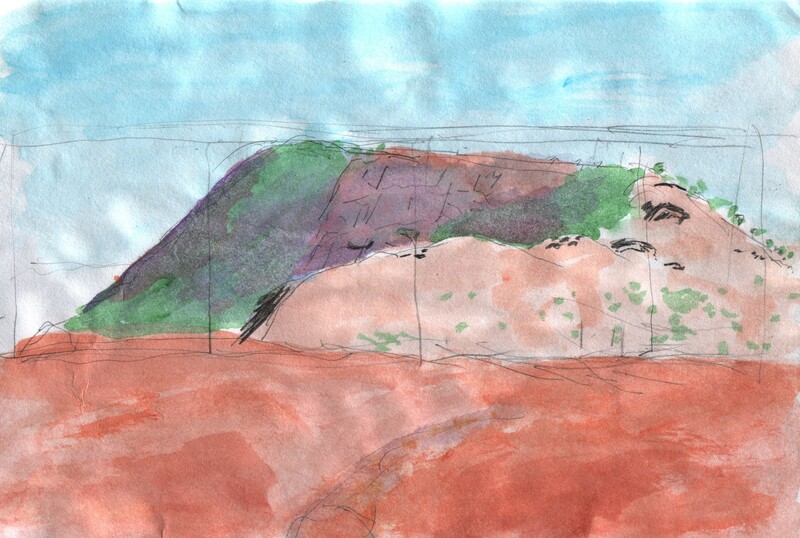 I was floored by the sheer number of sketches you completed during your India trip. 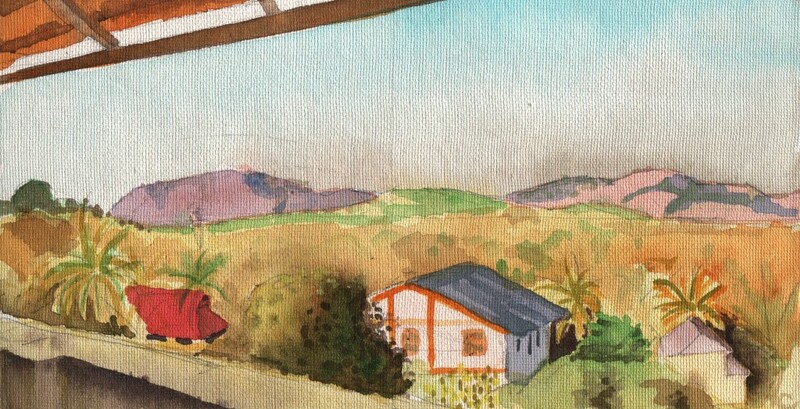 It’s all interesting to look at, but I think the watercolours impressed me the most. What a unique way to experience a place. Hi Dan. I’m glad that you had a look. I think that the quality is uneven, but I wanted to post them all anyway. I’m glad that you like the watercolours! I might make a “best of” or “favourites” section. I’ll try to figure out a “like” button so viewers like you can vote for candidates for the favourites. As for a “unique way to experience a place”, I agree. I am very glad that I left my camera at home and drew sketches instead.